Is there a food that you were deprived of as a child and now, as mistress of your own grocery list, you can’t get enough of? Well, I guess I really have a few of them, but one is certainly grape jam. There was never a jar of Welch’s to be found in our kitchen cupboard growing up. It was PB&J with raspberry usually standing in for the “J”…good, sure, but not that sweet, sticky intensely purple-black jam that I only had at friends’ houses (thank you Angie and Christy!). For my now-slightly-less-childish-palate, the storebought stuff is actually too sweet for me. Luckily it doesn’t take a whole lotta effort to make a few little jars of my own grape jam, with the sugar dialed down a few notches (or the grape dialed up). And now is the time to do it…the concord grape season is short, but it is now and, for the time being, they are pretty easily found at the greenmarkets here in NYC. I did a lot of research before making this jam, and the recipe is a hodgepodge of several I found, with the sugar adjusted to my taste. 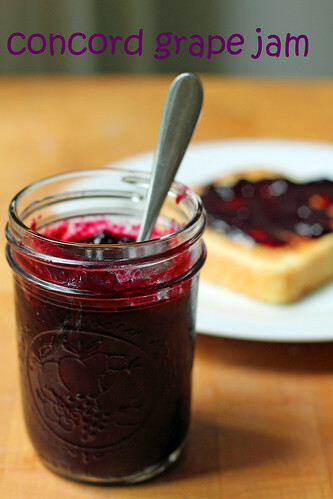 You’ll get a homemade jam that is very grapey and plenty sweet, without making your cavities zing. You do have to peel the grapes before you start, but with concords it’s a cinch…just give them a pinch. The skins practically fall right off. This recipe makes just a few half-pint jars of jam, so I don’t bother to can it. If you keep it refrigerated, it should last a couple of months at least. I will probably eat every last drop just like in the picture…spread with peanut butter over a slice of junky white bread. With potato chips on top. I was too embarrassed to show you that part. Steph’s Notes: I like the texture from the noticable bits of skin in my final jam. If you’d rather have a smoother end product, purée the skins with the sugar, salt and lemon juice in the food processor before adding to the saucepan in step 3. If you have trouble telling if your jam is done, you can pop a small plate into the freezer to chill. Spoon 1/2 teaspoon fruit mixture onto the cold plate and allow to set for 30 seconds. Tip the plate 45 degrees to one side; jam should be a soft gel that moves slightly. If mixture is liquid and runs quickly down the plate, return the jam to the heat and cook, stirring constantly, 2-5 minutes longer; then repeat the test. -Working over a large, nonreactive saucepan in which you will be making the jam (to catch juices), skin the grapes by gently squeezing each one between two fingers. The skins will pop off easily. Let all of the pulp and any juices fall into the saucepan. Put the skins into a medium bowl, stir in the sugar, salt and lemon juice and set aside. -Over medium heat, bring grape pulp to a simmer, cover and cook until soft, about 5-10 minutes. Push through fine strainer and discard seeds. -Return the strained pulp (now more like juice at this point) to the saucepan and add in the sugar/skin mixture. -Bring the mixture to a boil, stirring until the sugar is dissolved. Turn down the heat and cook over moderate heat, stirring frequently, until the liquid runs off the side of a spoon in thick, heavy drops, 20 to 30 minutes. Skim off any scum that rises to the surface of the jam during the cooking process. -Spoon the jam into three clean 1/2-pint jars (you can sterilize the jars and lids first with boiling water, if you are so inclined), leaving about 1/4 inch of space at the top. Close the jars and let the jam cool to room temperature. Store the jam in the refrigerator for up to 3 months.